A rapid transit system in the Russian city of Yekaterinburg, the Yekaterinburg Metro became the last of the thirteen Metro services to begin operations in what was the former USSR. It commenced operations in the month of April in 1991 and is spread out over a length of thirteen kilometers, serving only nine stations along the length of the route. It reported a daily ridership of 130,000 in 2012. 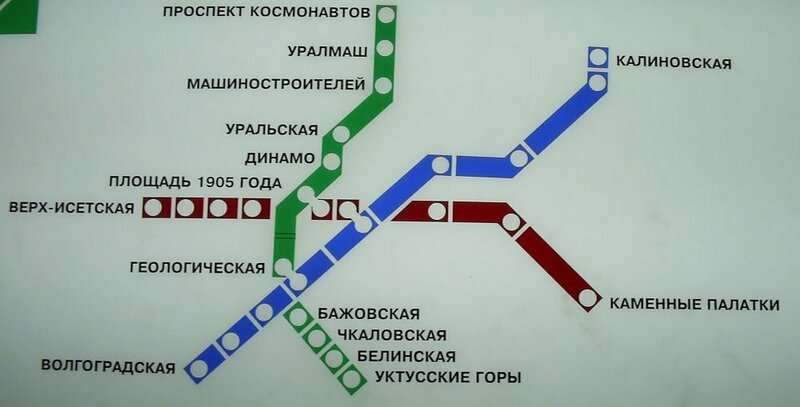 This Metro service has been built in a typical Soviet design: upon completion the network will seemingly represent a triangle with the intersection of three lines at the city center. The stations are built as either deep or shallow designs owing to the uneven landscape of the city. While the shallow stations bear single-vault or pillar-trispan designs, the stations at a deeper level are built on either Leningrad, Pylon or column designs. In keeping with the tradition of ex-Soviet Metros, the stations feature elaborate decorations although a financial crunch prevented the complete implementation of the original designs. Ridership on the service has witnessed a steady growth over the past few years, prompting the management to think about adding a new line to the network. A second line has been commissioned and construction is expected to start by the end of 2014. Map of Yekaterinburg Metro showing its stations. Click on the map to enlarge it or Download Yekaterinburg Metro Map in PDF.